Big news: Zwift Mobile Link (ZML) is now called Zwift Companion (ZC) app. More has changed than just the name. The new update includes loads of new features that make Zwifting more fun and intuitive. ZML has come a long way. First released in late 2015 to provide a Bluetooth bridge connecting a trainer to Zwift. 1.0 also let Zwifters see riders nearby when in-game, included “Zwifting Now” functionality, as well as a dashboard providing in-game stats. 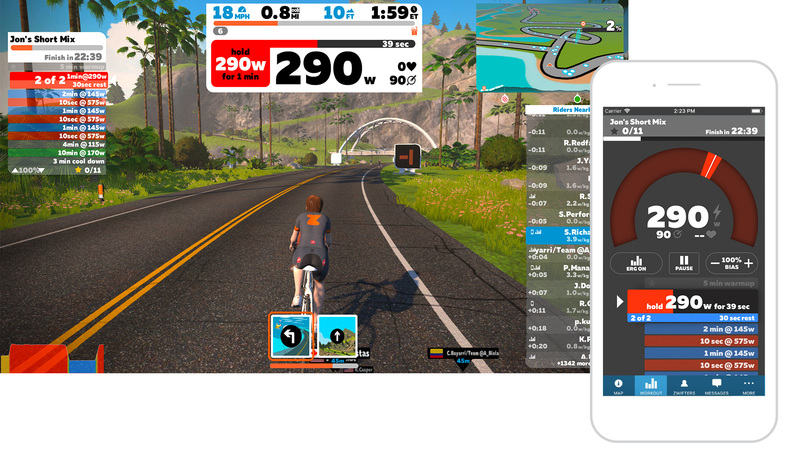 The original ZML made Zwifting more social, providing a platform for in-game messaging, following other Zwifters, and the ability to give post-game Ride Ons. Zwift Companion makes a big leap with a new window into your running activity, and Workout Mode. Begin a workout or group workout in Zwift, and the dashboard comes alive with a new interactive screen. Workout Mode displays your current power measured in watts, helping you stay on target and focus your effort. When paired with appropriate equipment, you can also view your heart rate and cadence. You can also pause/resume your workout. If you are using a smart trainer you can turn ERG mode on/off. And adjust your FTP on the fly with the + and - symbols, making your wattage goals easier or harder. Underneath the power gauge, you’ll see your current workout block, the effort required, and a live progress bar indicating how much time is left. Scroll down to see upcoming workout blocks so you can kick it into high gear when the time comes. Want to skip a block? Swipe left or right, and you’ll move to the next one. Not seeing the new workout screen? Make sure you are paired to Zwift, and currently doing a workout. If you are not in a workout or group workout you will only see the Zwift map. Workout Mode activates when you’re on the treadmill, too. The new feature helps you keep a targeted pace. Lace up and start a workout, and you’ll see your cadence/steps per minute displayed in real-time. The gauge instantly shows your target speed and acceptable range for each workout block. Your heart rate also appears, when wearing a monitor. Pause/resume your workout whenever you want, and adjust your speed target with a tap. Underneath the gauge, you’ll see your current workout block, the effort required, and a live progress bar indicating how much time is left. Scroll down to see upcoming workout so you can kick it into high gear when the time comes. Want to skip a block? Swipe left or right, and you’ll move onto the next one. We’ve now made it easier to see your current cycling and running level. On the home screen, your number displays next to the appropriate sports icon. 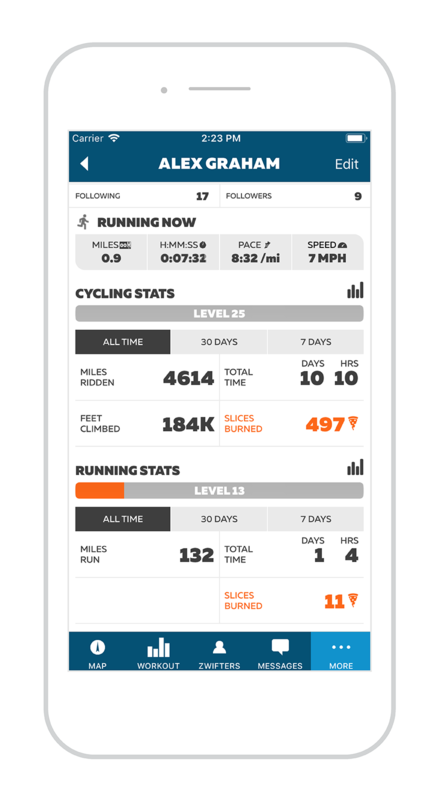 Tap your profile and view your cycling and running stats: level, miles/km covered, total time, and pizza slices burned. You can view these stats three different ways: All Time (cumulative) as well as the past 30 days or past 7 days. Don't have Zwift Companion? Get it from the Google Play Store, or the iOS App Store.